Crying Steel started in 1982 from the ashes of hard rock band Wurdalak. With Crying Steel the gentlemen wanted to get a bit harder and heavier and lean more towards heavy metal. A turbulent period in terms of changes in the line-up was the result. Also in the area of ? ?discography, it was mainly trying to get a foothold and when the band threw in the towel in 1990, only a full-album was on their name. Since 2003 Crying Steel has been trying to get a foothold again, but again it’s a coming and going of people, so a stable line-up seems utopian for Crying Steel.They are now three of their “second” career, but again we hear new people. Biggest change is the person behind the microphone. Since a while ago (at the end of 2016) it was announced that Tony Mills (Shy, TNT) would take the place behind the microphone for a new album, they were eagerly awaited by many fans of traditional heavy metal / hard rock. And they will be happy with the end result that Crying Steel is now releasing on the world. 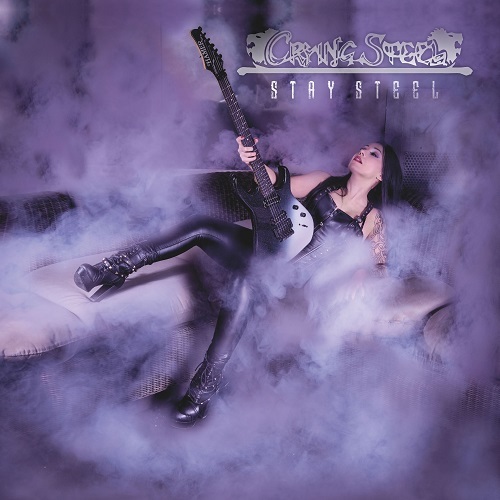 ‘Stay Steel’ contains twelve sturdy and powerful tracks where melody is central. Sturdy drums, pumping bass lines, heavy riffs, melodic guitar solos provide the perfect keys and if they are supplemented with the superbe vocals of Tony Mills you get a good album with which you have to pay attention. Innovative is not the least, but every right-minded heavy metal fan who loves bands like Judas Priest, Iron Maiden, Saxon, Shy or TNT, should give this a chance: most likely after listening to this album with the album under the arm step outside the record store. Sturdy, powerful songs with easy to chant choruses, beautiful vocals and clever inventive guitar solos that invite you to gird your air guitar are your part. Hopefully the line-up is now stable enough to support this live and to think about new work.